Best person in the Cascadia Weekly Best of Bellingham 2012 edition. A Bellingham icon and I know Betty Desire. Famous as a drag queen who has a very strong social conscious. Always reminding people to vote and, these days, asking folks to vote "yes" on Referendum 74; legalizing gay marriage in the state of Washington. Betty preforms at various venues, including Rumor's Cabaret where she encourages people to feel comfortable about themselves, remember not to drink and drive and to have a good laugh. Much of her audience isn't gay so she goes beyond preaching to the choir. 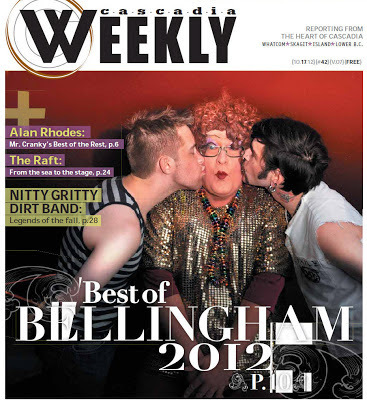 As her Best of Bellingham nomination shows, Bellingham is, for the most part, a very gay friendly and open minded community.